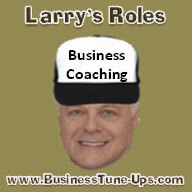 Larry Rudwick (a.k.a "Larry The Tune-up Guy"), small business coach and consultant, primarily works with privately owned businesses, helping them to set SMART goals, and create strategic plans. 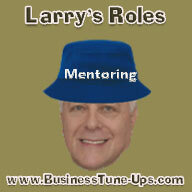 When appropriate to clients' needs, Larry will facilitate meetings with employees, brainstorm, mentor, and be a trusted advisor. 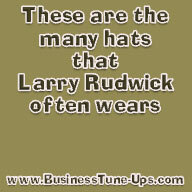 Larry Rudwick graduated in 1974 from Cornell University majoring in Transportation Planning in the Engineering School, and minoring in business. 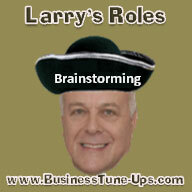 Larry is quite innovative and, since his youth, one of his passions has been small wheeled-vehicles. After college, he invented three different vehicles (a pedal "go-kart", a hybrid/electric bicycle and a sports wheelchair), all of which were patented, and were licensed to other businesses. Larry co-founded a business that designed, manufactured and distributed wheelchair parts and accessories primarily to medical supply stores. This company, Production Research Corporation, grew to over 65 employees, and became "The Best Source for Wheelchair Parts and Accessories", obtaining a 45% market share. After 19 years of continuous growth, it was successfully sold to America's #1 wheelchair manufacturer, a large public company and its chief competitor. Here are his "secrets to success" in the wheelchair parts business. After Larry's wheelchair parts business was sold, he continued to finance further development of the enterprise distribution software that greatly helped make his wheelchair parts business so successful. Learn more about this enterprise distribution software. 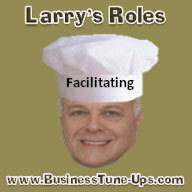 Larry's professional passions are 1) business, 2) helping and encouraging people to succeed, and 3) making great changes happen in enjoyable ways with people that are energizing and enjoyable to work with. 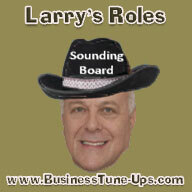 Larry The Tune-up Guy now spends much of his time helping executives and other business people focus on setting/meeting their goals. He also is passionate about writing, editing and growing his executive coaching website. He received an Executive Coaching Certification from Drayton Boylston of The Rescue Institute. 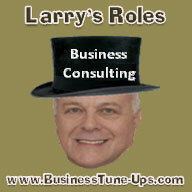 Larry is now quite involved in the risk management field through an association with RiskMap® Risk Analysis Services. Larry's a member in good standing at the International Coach Federation, the "largest worldwide resource for business and personal coaches", and is bound to uphold these Code of Ethics. LinkedIn and Twitter For more information, see his LinkedIn profile. And find or follow him on Twitter as "TuneUpGuy". Larry is happily married to his wife Sally, a petroleum engineer, shown above on a recent trip to the Caribbean! Larry is the proud father of 3 sons. All three have graduated from engineering schools, and are gainfully employed.